This is a summary of events that are outlined in full detail starting with Season 2, episode 10 of the Halo CE Chronicles. The opening monologue is told from the point of view of Corporal Andrew Johnson a marine exo-biologist assigned to the UNSC Fearless. Like machinima, the comic has been made using the actual Halo CE game engine with custom maps modified for this specific use. 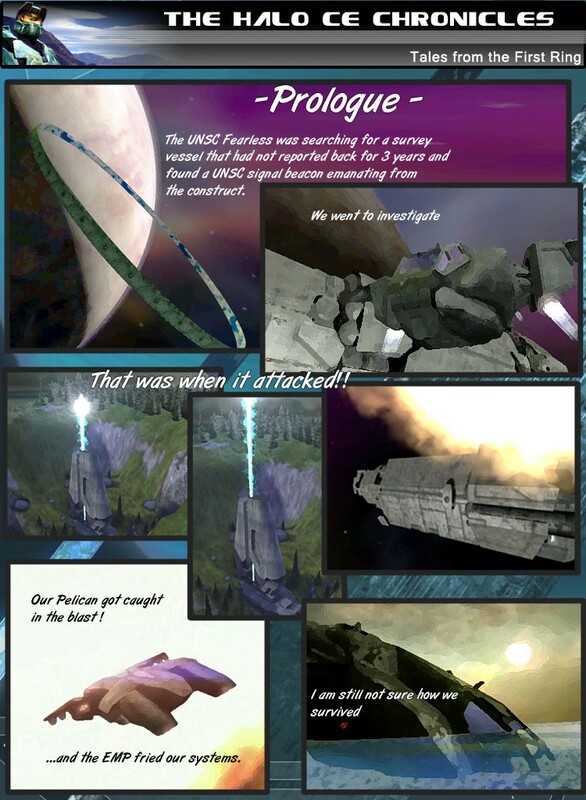 Each panel is a screenshot from the game taken using the developer’s camera and then enhanced and touched up using Photoshop. Since I didn’t draw it maybe it should be called a “machcomica” (mack-comic-ah) for machine comic. I've enjoyed all of you work so far Dennis. Thank you for the effort you put into making these stories. what should i put the title on my book? This is really good. A few laughs and serious drama. I cannot wait until the final season arrives. Awesome Comic. funny too. The marine who talks lots and has a small beard is cool. We call him Carl. Nice story. these comics need a little more funny,but so far I like them.